Last week, Federal Communications Commission Chairman Ajit Pai made headlines when the National Rifle Association named him the recipient of the Charlton Heston Courage Under Fire Award at the Conservative Political Action Conference and announced they would bestow on him a handmade long gun. But on Thursday, Pai wrote to the group to turn down the gift, following nearly a week of outcry over both the ethics and the optics of the tribute. 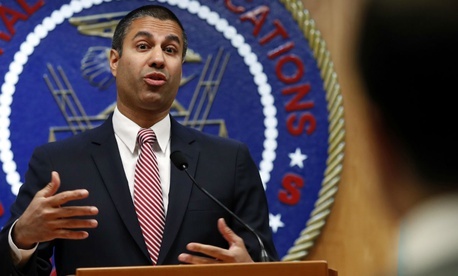 At the heart of the issue are government ethics rules prohibiting FCC officials from accepting any gift worth more than $200 without go-ahead from agency ethics experts. In a letter obtained by Politico, Pai said that he was “surprised” by the award and his staff stressed that he must not be given the gun on stage until after ethics attorneys evaluated the situation. Pai’s firearm fiasco was the latest in what was a busy week for top-level Trump administration officials attempting to get on the right side of ethics rules. Housing and Urban Development Secretary Ben Carson cancelled an order for a more than $31,000 dining set for his office, White House Press Secretary Sarah Huckabee Sanders told reporters Thursday. News of the purchase, which is well above the $5,000 legal price limit for improvements to the HUD secretary’s office, rankled Washington after it was first reported by The Guardian. Helen Foster, erstwhile HUD chief administration officer, filed a whistleblower retaliation claim with the Office of Special Counsel, alleging she was demoted for raising concerns about the price tag of the office improvements. House Oversight and Government Reform Committee Chairman Rep. Trey Gowdy, R-S.C., sent a letter to Carson Wednesday requesting information about the furniture purchase and Foster’s reassignment. For his part, Carson claimed in a Facebook post that he and his wife Candy, who also was implicated in the allegations, had done nothing wrong. And at the Environmental Protection Agency, after weeks of scrutiny over his travel habits, Administrator Scott Pruitt told CBS News Wednesday he would begin flying coach. "What I've told them going forward is this: There is a change occurring, you're going to accommodate the security threats as they exist, you're going to accommodate those in all ways, alternate ways, up to and including flying coach, and that is what's going to happen on my very next flight," Pruitt said. "So those things are happening right away."